I now have it, by the way! has anybody on the forum got that CD single? I'd love to hear the b-sides, and would do someone a compilation in return. She had a track on a Christmas compilation that was on one of the mags (Mojo i think) a few years back. CD was called Blue Christmas iirc, lot of soul type stuff on it, she did The Little Boy That Santa Claus forgot. That track is now on iTunes. 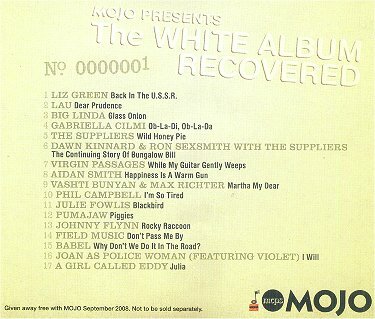 Erin turned up on a recent Mojo magazine cover CD of the Beatles 'White Album' which had her version of Julia. All quiet on the western front (again). A quick trawl on the 'net didn't find anything recent. Doe anyone know if she is working on new material or has called it a day? Her album came up on the old ipod today and mighty fine it is. Granddaughter of 6 months is called Erin......lovely name. Erin has been in the studio in Nashville so we may not have long to wait for that second album. Erin's new album is released on 1 September. Fantastic! Does it have a title yet? Not yet, that's all the news she has given so far. I'll post once I have the title. 1 (the super obvious one). What took you so long, and why now? 14 years a long time between drinks! 2. Does the album have a name yet (Assume it's not 'You Get The Legs You're Given')? 3. Will there be a single release prior to the September 1 album release? 4. Could you describe in what ways you feel the album is similar and/or different to 'AGCE'? 5. Could you tease us with a few track titles (One seems to be NY Man)? 6. Richard Hawley famously and beautifully collaborated with you on AGCE. Is he, or any other notables involved in the new album? 7. Is A GIRL CALLED EDDY planning to go back on the road in late 2018? I get a weird feeling from that interview...like maybe it was made up. Maybe I'm just being skeptical. Can't find any other mention online of her return. September 1st is not even a Friday. Does Richard have any involvement with Eddy's new album?